Yea so once again I want to thank each and every one of you awesome fans for always sticking by my side whether I am posting recipes daily, weekly, or monthly or not. My life has been a whirlwind of events that are totally consuming all my time but I am trying my best to get on here and keep giving you new content. Don't worry though, when I hit a lull in my hectic schedule I will post some awesome recipes for you all. I happened to be at home today with a friend and decided it was time to experiment. Well this experiment will honestly make your day, week, month, and maybe even year. The flavor combination in this with the subtle after taste of coffee just leaves you wanting more. I apologize in advance for causing you to over eat once you make these. Enjoy. Hi, I haven’t made the brownie yet, but first of all I would just like to ask about the baking dish. Is 9×13 in inch or in cm? Thanks for the reply in advance. I’m not sure why, but I’ve tried making these a few times and they never really solidify. Any suggestions? I end up putting them in the freezer and eat them frozen after I cook them. They’re only about 1/4 to 1/2 inch thick. I’m no fancy baker by any means (usually the first time I make things they turn out terribly) and nailed these PERFECT the first time. Super easy, and even though I was in doubt about the blueberries in the recipe (I’m not a huge blueberry fan to begin with), they’re so good in it! Would definitely make these again! No flour in this recipe?! I made these for a bake sale, and they were specifically requested for the next bake sale. win! Do you use regular ground coffee in this, or instant?? Do you mean instant coffee? This was AMAZING! I made my own coconut butter out of desiccated coconut because that was all we had on hand and some virgin coconut oil all nicely blended up. Then to the batter I added maybe a tablespoon or two of almond meal I had left over from another recipe. I also left out the cinnamon but upped the cocoa to make up for it. Oh and I also didn’t end up melting the coconut butter. So many changes but it turned out DELISH! Such a good recipe. Whole family loved it and the little ones didn’t even notice the difference from the usual brownie recipe. :) Success! Well, I am no dessert chef but decided to make this as had people coming for dinner so felt obliged…it was easy to make (a little difficult melting the coconut butter in the jar), aesthetically pleasing, impressive and most of all scrumptious. Thank you for sharing. I’m confused on what coconut cream concentrate is. Is it similar to coconut butter/manna? Where you blend up dry coconut flakes in a food processor until it turns into a sort of butter that’s solid at refrigerator temp.? The grocery store guy gave me Coco Lopez. Maybe that was my problem. The recipe is SOUPY after 25 minutes. I have never heard of coco lopez, what is it? Mine are in the oven right now. I used organic maple syrup instead of honey and am considering not icing the brownies. I’m considering the calories that are in there which I’ll strive to calculate. I love the unusual combination and they were easy to make. Phone isn’t letting me rate the recipe with the Stars below the comment box, but I say 3/5 stars. I was impressed. I wouldn’t go out of my way to make them again but they are absolutely worth the try! I just like making new things. I didn’t add the cream on top because I was out of it. Used all in brownies. Well done! Do you any flour (almond or coconut) in this recipe? These are delicious! The coconut/pecan combination reminds me of German chocolate cake. Yum! I made my own coconut cream concentrate/coconut butter in my baby bullet. I used the dried, unsweetened coconut from the bulk bins at Winco. :) Thanks for the recipe!! might as well use sugar, how is this paleo LMAO. Natural sweetners, like raw honey, are paleo MJ. You should check your sources. Opposed to sugar, Honey has a lot of medicinal purposes. It was used in a lot of healing practices in ancient Egypt. Check your sources, and educate before you respond. Brownie points (pun intended) if you use a local to you raw honey, not only do you get the nutritional benefits of raw honey, you get the benefit of a little local pollen immune boost. I love this recipe and have made it often, even wrote it down at one point. Had to come back to get it again, my daughter in law ran off with my paper! All I can say is….aaamazing! I just came across your recipe and decided it looked so good I just had to try it. Well, you did not promise too much when you wrote it would make my day, week… year! It sure did make my day – it is wonderful. I did not have coconut cream concentrate (don’t know if I can get it here in the middle of Sweden), so I used nearly 3/4 cup of coconut butter (oil) and 1/4 cup whipping cream instead. I forgot to melt the coconut butter but it mixed very well nevertheless. I also used frozen blueberries that sort of disappeared but made it totally moist and yummy. It is the most delicious dessert and I am afraid it won’t last the night… I served it with a knob of whipped cream… Mmmmm… Can’t wait to share this with my fb friends! I have a problem. These look awesome, but I am allergic to coconut. what can I do? Experimenting with the paleo diet and have been following your FB page for a couple of weeks. The recipes look great and am looking forward to trying them out. One question on this recipe. 1 cup coconut milk goes into the batter and then you use extra to drizzle over the brownies? Coconut cream concentrate, otherwise known as coconut butter is what you use to drizzle over the brownies. Would it work if I used frozen blueberries instead of fresh? I love all your recipes but I can’t use honey because I cook for a diabetic. I use Just LIke Sugar. Im not sure if I can replace honey with it because honey is liquid. I have Yacon syrup too but I don’t know about using that as a replacement either. Any suggestions? How do you get the coconut cream to actually melt? I tried small pan on stove top but it turned toasted almost instantly even on low heat. I tried the microwave but it wouldn’t stay melted more than a few second. a quick shout out and tell yyou I really enjoy reading your blog posts. Can you recommend any other blogs/websites/forums that go over tthe same topics? These were incredible! I made my own coconut cream by putting 4 cups of unsweetened coconut flakes in my food processor for 20 min. I am currently 3 weeks into the Lurong Paleo Challenge & it was awesome to have what tasted like a “sinful” treat! I shared the recipe with the others members of my box. Thanks so much! How the hell am I supposed to get through all 18 before they go off without feeling like a glutton! How would these do without the blueberries added? I’m so excited to make these! I actually have blueberries in my garden. Just found your site and made these last night for the family and they loved them. Kids were hungry for more. I was wondering if you have the nutritional information for them as prepared? I don’t calculate nutritional info. Thanks for this recipe, it’s awesome! I do have a question how should I store these? Can they be left out or fridge? Thanks! Made these tonight. But used fresh Strawberries instead of Blueberries. And didnt use ground coffee. They were amazing. Made this today. Added 1tbsp coconut flour as the batter seemed a little runny. Made it in mini muffin pan. They are delicious! Omg. These look fantastic! Where do you prefer to get your coffee from and What brand of coconut cream concentrate do you use? Is the coconut cream concentrate mandatory or is there something else I can use in its place? I just made these last night and they are the best brownies I have ever had!! And probably the healthiest!! I want to make them again but I don’t have anymore coconut mana (I just ordered some). Is there anything I can use in place of coconut mana? Besides shredded coconut because I’m almost out of that too! In your recipe book the coconut cream is listed last in the ingredients. In the method it does not say put coconut cream in the batter, just drizzle over cooled brownies. I wondered how you can say your recipe makes 18 muffins when I only managed to squeeze out 6! I have just made these brownies for the second time, still without the coconut concentrate (I wasn’t sure what it was!) My batter was very runny. Will the coconut cream concentrate make it a bit thicker? I am going to hunt some down and make them again. I saw this recipe elsewhere and possibly because of the way it was written, that poster experienced the same confusion as Siobhan, and therefore LEFT OUT the 1 cup of coconut creme. The only mention of it was at the end. add the part in parenthesis to avoid confusion. love to try this treat. I do have a sweet tooth so its good to see I don’t have to give that up. Lovin’ all the amazing things you post! Any thoughts on the nutritional info on these bad boys?? I’m making them anyway, just curious. Can I change the pecan to almond? Will its taste be completely different? I would like to bake it for Christmas but pecans are very expensive for me. I followed all the directions and these turned out nothing like yours!! Don’t know what went wrong. The consistency is really gummy and they’re more like really thin bars than brownies. And the coconut cream concentrate that I drizzled over the top just melted in, even though the brownies were cool. :( So sad, because these looked amazing. Marissa, it is hard for me to know what happened. What brand of coconut cream concentrate did you use? ThtThanks so much for the recipe George, I can’t wait to try them. I’m going to make then this week to take to a pot luck. Do you actually put in ground coffee? Or is it instant? George, I was so surprised at how wonderful these turned out! Amazing! I baked them in the mini muffin tins too. Thank you! Hey everyone, made the brownies to specification, just wanting to see how everyone has gone with them, mine came out fairly soft and moist, and very oily, could we add coconut flour to kind of soak up the coconut oil a little? You know I just heard about MM Livestock from another Marine Wife. I will definitely start purchasing from them! This recipe looks fantastic and I think my kids will love it! Thanks for sharing! I’ve made these several times. By themselves they are great but i like to serve them in a parfait dish surrounded by fresh strawberries or raspberries and just a drizzle of melted high cacoa dark chocolate. Mmm Mmm Good! Does the coconut cream only go on top or also in the mix? I can’t get the creamed coconut concentrate in Canada (if I order it it costs 1.5 times the cost of the product just to ship it + duties). Is there any way to substitute a combo or oil & coconut cream? I really want to try making these, but don’t know how without the CCC. I’m going to gaze at this recipe longingly until I finish the 21-Day Sugar Detox. Then I’ll make it when I have lots of folks who can help me eat it so I don’t undo all my good work! 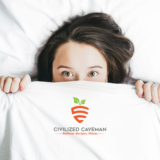 Thanks for providing tasty, free, gf, paleo recipes-appreciate that people like yourself take the time to help us all eat well. Going to try add some coconut flour to the next mix and make a “Black Forest” cake with coconut yoghurt and fresh strawberries squished between 2 of these brownie mixes.Awesome as they are though! This recipe is all class. Looks so yummy!!! This will be a treat for after I’m done my whole30 and over Easter. Can’t wait to try it! Tried it today, and YUM! What a great combination of ingredients. I already posted on fb, but I just wanna emphasize, again, how BOMB DOT COM these are! At first I thought it was funny that you use the word amazing to describe all your recipes, but SERIOUSLY, George, I see why!! BEST BROWNIES I’VE EVER HAD. I’m sharing them at work & they’re disappearing like hotcakes! I did made mine in an 8×8 pan, but I hate using that pan bc it’s smaller than a 9×13…which, in my mind, means brownies that disappear faster. LOL I ate a fourth of the pan within 20 minutes! Gah. I’m gonna make another batch ASAP and use 100% raw cacao powder, since it’s a better choice than the Hershey’s unsweetened cocoa I have. THANK YOU SO MUCH AGAIN!!! P.S. I know you’re a man and can totally take it (lol), but I hope I didn’t hurt your feelings or ruin your day when I commented about your chili the other day- I thought about it and I felt really bad bc I think I should’ve just stuck to the positive aspects bc your recipes are fantastic and you deserve nothing less than consistent encouragement!! Keep rockin’ the Paleo deliciousness! Chrissy I am so glad you enjoyed them and I saw the picture on your facebook, thanks for sharing. I did outdo myself with these ones too, I am avoiding making them again due to their addicting properties lol. Wondering if the Coconut Cream Concentrate should be solid or liquefied when using in the brownie base? In the oven. The batter alone was insanely delicious. Thanks for another wonderful recipe George! nom nom nom!! These are so frakking delish! Miss you MORE!! Thanks for keeping up with all your awesomeness. This is a great recipe. 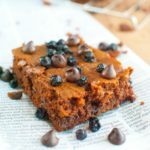 I have a recipe that I use for espresso fudge brownies, but it is very different, so I will be anxious to try this one out and add the blueberries! Only two weeks to go and I’ll be done with Whole 30!! Aaahhhh!! I WANT THESE. SO BADLY. It’s all my favorite flavors…together…in brownie form. OMGGG. Does the 1c coconut cream concentrate go into the brownie batter or is that only for the icing? Perfect, thanks! :) I’m gonna try those tonight! where does one get coconut cream concentrate? whole foods? I buy mine as coconut manna… It is the same thing I hope? Love the recipe, at the tail end of my whole 30, so I can’t wait! you can also make it by blending shredded coconut. add a little coconut oil if you want it softer. it will come out of the blender melted and eventually harden like the stuff you get in a jar.